Despite the showers, we set off after lunch for one of east Kent’s finest gardens. That could be read as faint praise, given east Kent has a complete dearth of good gardens open to the public. 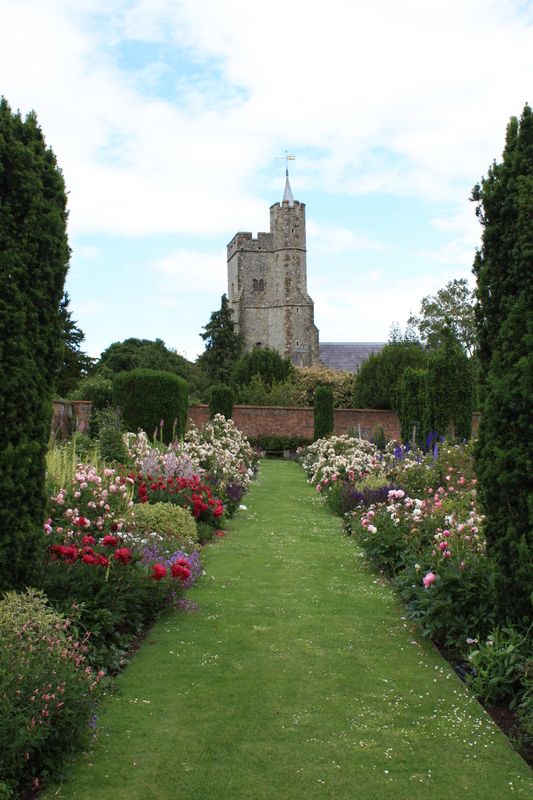 However, Goodnestone is a fabulous, intimate garden which is at its absolute best this month. It’s a garden that steers a happy course between wild and overworked, and still feels very much like a private domain. The Dowager Lady Fitzwalter is always reliably at the entrance, greeting visitors and pointing out seasonal highlights. Her passion for plants comes across in spades, but it would be hard not to feel passionate about a garden which must have taken such energy and committment to create. The garden has two main highlights: the first a woodland garden, full of graceful dogwoods and ancient sweet chestnuts. More on that in a future post, for the crowning glory of the garden in June is the walled garden. 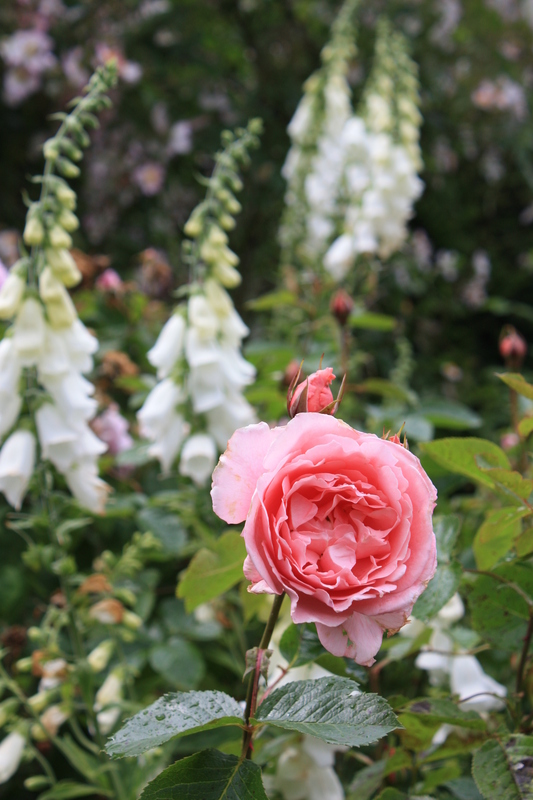 There is nothing quite like an English country garden in June – lush, full blown and exuberant, full of fragrant roses and alive with birdsong. And boy, is this a cracking example. 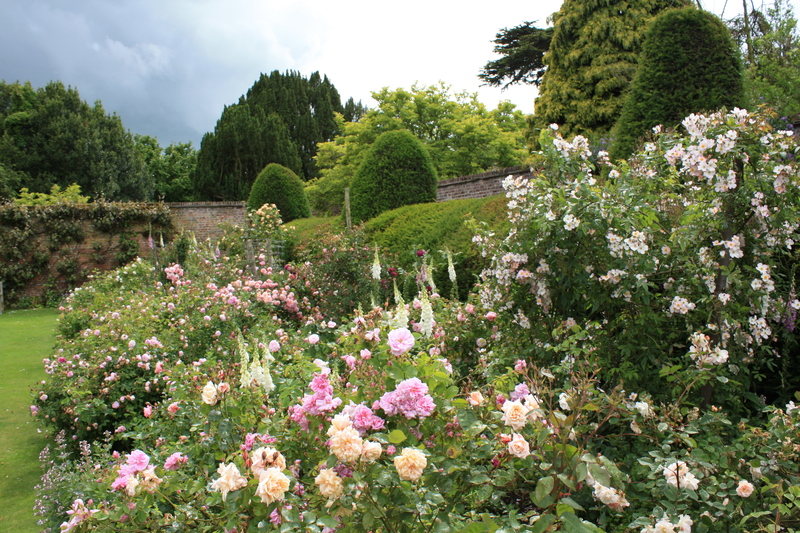 On arrival it is the smell of fresh, damp parkland which greets you but, on entering the garden, the spicy, clove-like fragrance of the old fashioned roses soon takes over. The walled garden is made up of three sections. The first is quintessentially English – borders packed with roses in every shade, from white through to deepest damson purple. 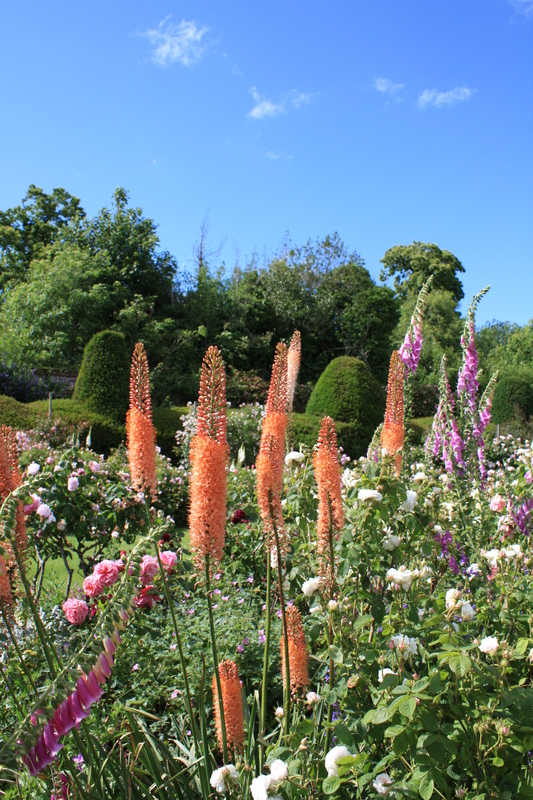 Interspersed between are salvias, foxgloves, Nepeta and Eremurus – the foxtail lily (see below). Although the orange spikes clashed joyously with the predominantly pink flowers nearby, it was hard not to be impressed by these lovely bulbous plants. Eremurus like open ground and enjoy a good baking through the summer. This year they may be waiting a while. The second compartment is centered on a long, reflective pool – a relatively new addition to the garden. On one side, white and yellow themed borders provide a break from the riot of pink next door. On the other side, a warm brick wall provides the backdrop for lavendar, alliums, Romneya and several vigorous climbing roses and Clematis varieties. 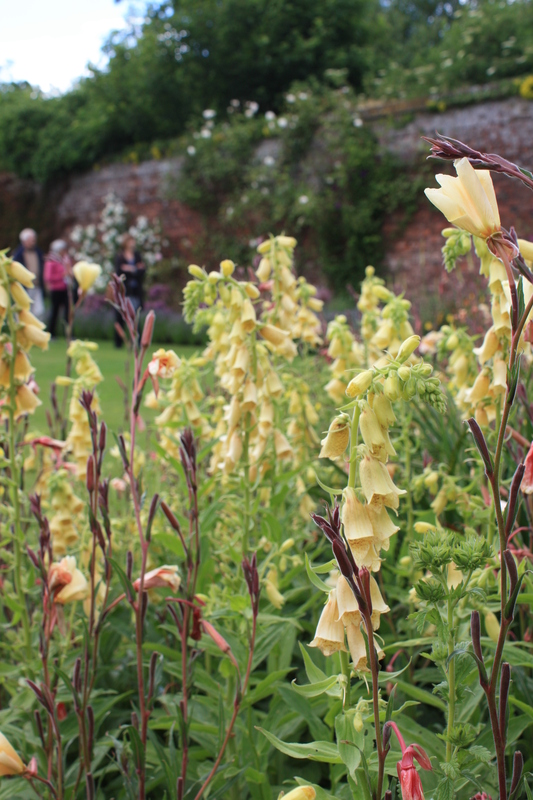 A combination of sulphur yellow Digitalis and evening primroses (Oenothera), was especially eye-catching in the yellow border. 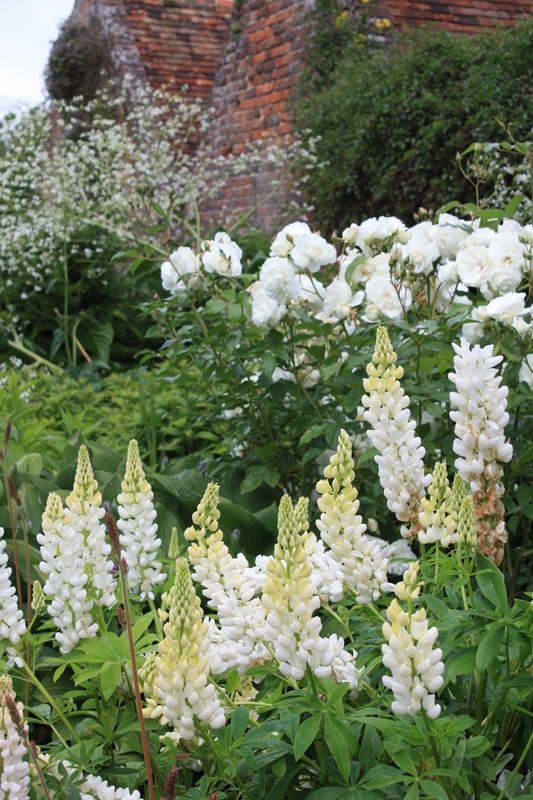 Pure white lupins (miraculously undamaged by slugs and snails) flourished nearby against a giant cloud of Crambe cordifolia and white “Iceberg” roses. The final garden is a productive garden, crammed with flowers for cutting, vegetables and fruit trees. The main feature here is the view to the spire of Goodnestone church – hard to imagine a more picturesque vista. The borders here oozed fertility, and sections had recently been planted out with Zinnia, Cosmos, Cleome and Nicotina to prolong the display later into the summer. Hopefully we’ll return to enjoy these in a few months. The enormous Wisteria, which had enveloped the farthest wall, had been given a hard prune in order to replace the supporting wires. Judging by the new growth it won’t take long for it to become a focal point once again. 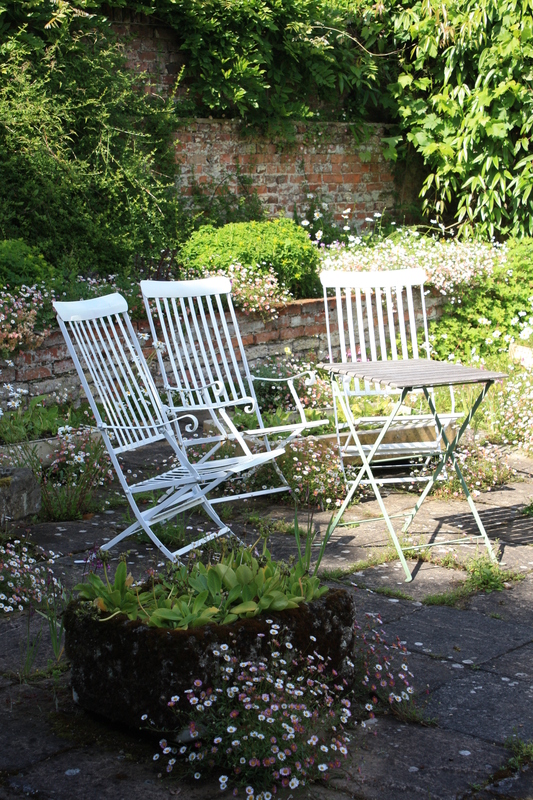 The route back to the car park and tea rooms then winds past a lovely Victorian greenhouse to a quiet sitting area, bedecked with thousands of white daisies (Erigeron karvinskianus) and more alliums. A better place to sit and unwind at the end of a day’s gardening it is hard to imagine. Just a pity there was no-one on hand with a G&T, but I guess you can’t have everything. Thanks for telling us about this lovely garden! Looking for gardens in the south of england for this summers garden tour and found you!! I will now look at your other recommendations. There are so many Mari, you will be spoiled for choice. Let me know if you need any help deciding, and what time of year you will be visiting. Happy travels.